Insigne iuris auctorum adhibens in notitia iure auctore. Ius auctorum' est genus iuris de iurum auctorum scriptorumque librorum et operum artis. Sors proprietatium intellectualium est et status dum absens ius auctoris dominium publicum appellatur. ↑ Reijo Pitkäranta, Lexicon Finnico-Latino-Finnicum. WSOY, 2001, s.v. Tekijänoikeus. ↑ The Berne Convention allows member countries to decide whether creative works must be "fixed" to enjoy copyright. Article 2, Section 2 of the Berne Convention states: "It shall be a matter for legislation in the countries of the Union to prescribe that works in general or any specified categories of works shall not be protected unless they have been fixed in some material form." Some countries do not require that a work be produced in a particular form to obtain copyright protection. For instance, Spain, France, and Australia do not require fixation for copyright protection. 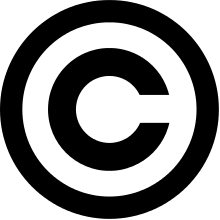 The United States and Canada, on the other hand, require that the work be "fixed in a tangible medium of expression" to obtain copyright protection. U.S. law requires that the fixation be stable and permanent enough to be "perceived, reproduced or communicated for a period of more than transitory duration." Similarly, Canadian courts consider fixation to require that the work be "expressed to some extent at least in some material form, capable of identification and having a more or less permanent endurance." Harvard Law School, The Scope of Copyright Law. Novissima mutatio die 21 Aprilis 2018 hora 19:11 facta.